I have always been interested in protest and civil disobedience. What first caught my eye was an episode of Whale Wars on Discovery Channel some years ago where activists were going to Antarctica and using direction action techniques to intervene in illegal whaling. Several series on, and last year I decided to go and photograph a protest against Japan’s hunting of whales and dolphins. 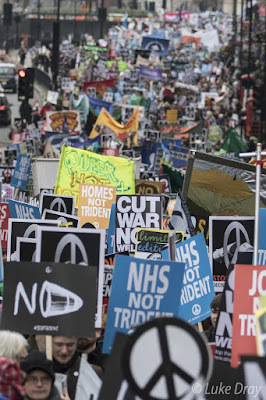 Since then I have covered over 30 protests in all sorts of shapes and sizes. Be it nice peaceful ones to anarchists going on a ‘stroll’. 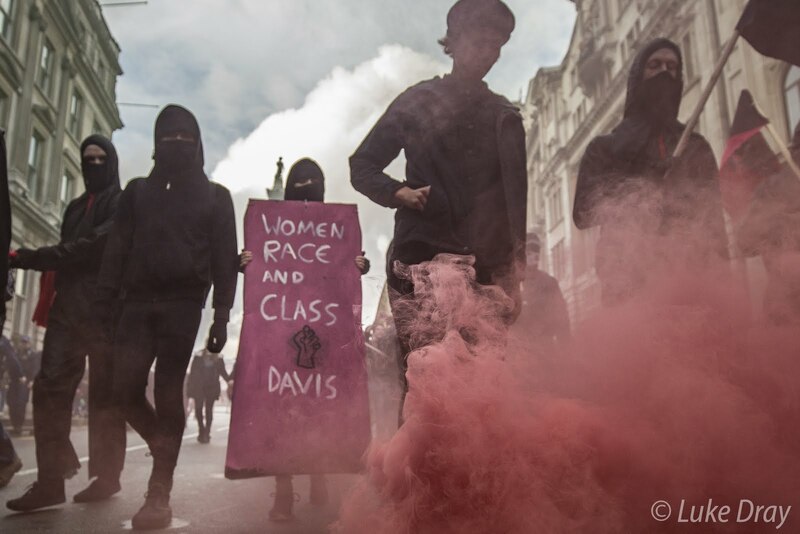 So on that note I decided to write an article on protest photography tips! 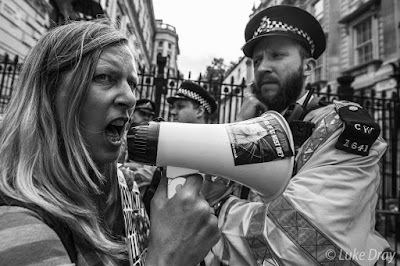 Unlike normal street photography, you don’t need to be overly cautious about sticking your camera directly in someone’s face, it’s precisely what most people at the protests are asking for…media attention! There’s going to be all sorts of different emotions on display at a demonstration. People shouting, cheering, crying etc… Go to where the action is and try to capture it. I find a lot of the time a tele-photo lens is ideal for this as it makes it easy to single out protesters, focusing in on their expressions. I use a Canon EF 70-200mm F2.8 IS II for this but a cheaper, and somewhat lighter option would an F4 lens of the same focal range. 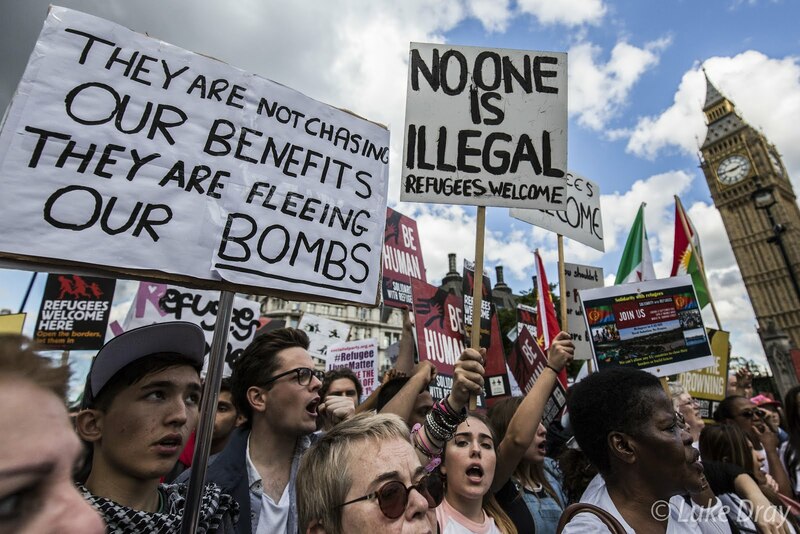 I was covering a pro-refugee demonstration last year and Corbyn had just been elected as the new Labour leader. His first speech as leader was at the rally and I was one of only a few photographers there to document the historic event. Pictures always mean more if they have a unique/historic context. People will probably bring some pretty interesting signs, and capturing them will help you tell the story of what’s going on. In addition to getting in close and capturing details and emotions, it’s also good to step back and show the context of what you’re photographing. Two good ways to show the crowd are from getting up high or shooting down a line of people. Both a wide angle lenses and tele-photo lenses are good for this but for different occasions. Clashes make for interesting pictures, but bring protective gear! Protests sometimes include clashes between the two sides, usually the protesters and police. These make for interesting photo opportunities, but be careful because the police are indiscriminate on who they target, especially if you haven’t got a UK press card, and I advise on taking a helmet (even a bike helmet will do) if you want to get into the thick of things. If you have the option to shoot raw, do it. It will give you much more flexibility in fixing mistakes you make in exposure etc. when your editing later. There’s a huge difference in how much you can salvage and fix between raw and JPEG, so if you have the ability and memory card space to shoot raw, you definitely won’t regret it. Since everything is happening so quickly, it’s difficult to capture exactly the pose or expression you’re looking for. Get into position and take numerous frames (use a continuous shooting mode if you have one). You’ll probably end up with a lot of junk and a few corkers. Luckily I have never made the mistake of not brining enough memory, when its ‘all kicking off’ I can shoot 32GB in a matter of minutes. You don’t want to end up in the situation of filling up the card when there are still photos to be shot, and having to end up deleting photos to make room for more. You’ll only miss the prize winning shot. Dress quietly, don’t wear badges or slogans. Remain clearly separate from participants and from police. Know the area or at least have a copy of a local map. Try always to have at least two ways to get out. Look after your kit. The most important item is YOU. Take a helmet (bike helmet will do), good boots, water and food. If the police get their riot gear out its time for you to make a decision, because you could be there for the long haul. By this I mean getting caught in a kettle (protest containment, where you can be kept for hours). 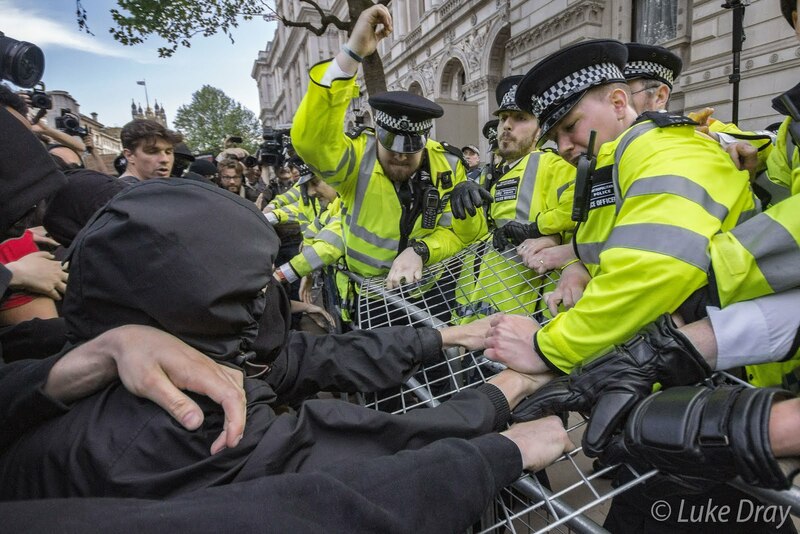 This is also where it could turn nasty – I know photographers who have been injured by police batons or charging horses. When things get rough, other journalists and photographers are your protection. Stay in sight of them. Watch out for each other. Keep an eye on fellow photographers in case they need help. I was covering a riot last November and a photographer got run over by an Aston Martin that was being kicked by protesters. I had to ring for an ambulance and provide medical assistance before they arrived. Let someone know that you are covering the protest and tell them what time you are leaving and at what time to expect you back. 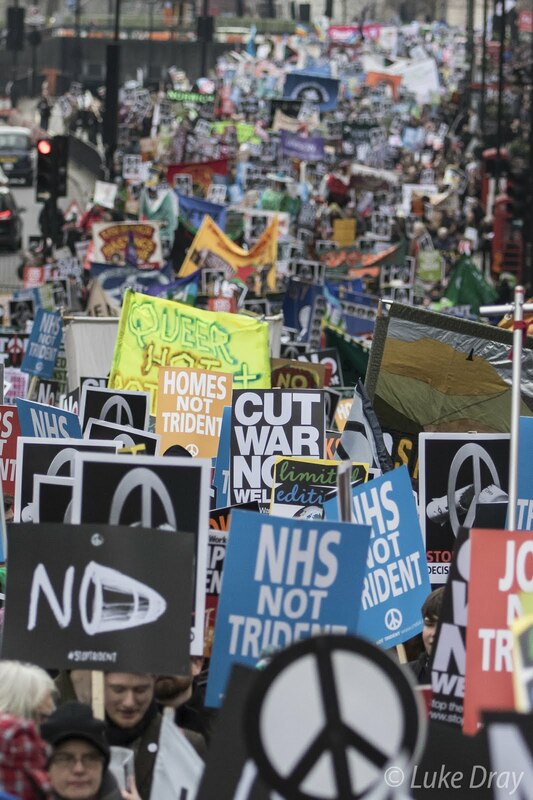 Most protests don’t turn violent, so don’t let my scaremongering put you off! Luke is an employee of Park Cameras in our Burgess Hill store, and recently won the 'Young British Life Photographer' award in the the British Life Photography Awards for a series of protest images.